One in a series of programs produced by Clark Coolidge that feature the works of late 20th century poets, sound poets, and authors. 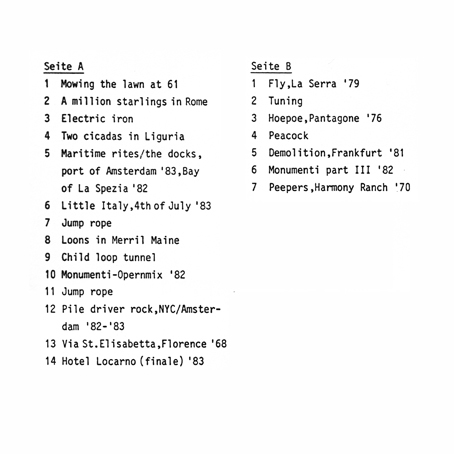 This recording, broadcast on October 13, 1969, features a two tape works by Alvin Curran. The first piece, “A Day in the Country: Part 1” is a compilation of ambient recordings made in Italy that range from the sound of children playing to those of a walk along a shoreline. These sounds have then been spliced together so as to form a continuos soundscape reminiscent of, appropriately enough, spending a day in the countryside. The second composition, “The Rubber Bee”, made in collaboration with Clark Coolidge, is a slightly more traditional piece of sound poetry, although it is sparser than many examples in this series. Charles Amirkhanian presents an Ode to Gravity program featuring an interview with the composer Alvin Curran from his home in Rome. Selections from this informal talk with Curran are interspersed with musical excerpts, with a special emphasis on the group Curran helped found in the mid-1960s, Musica Elettronica Viva (MEV). The composer discusses his co-founders, who included Frederic Rzewski, Richard Teitelbaum and Alan Bryant, and describes the synthesis of the group, its working methods, and the situation that led to its disbandment. Curran further describes the group’s second incarnation, MEV2, and briefly discusses his own recent work, Music for Every Occasion. The program concludes with selections by David Ahlstrom and Robert Erickson, released on an Orion disc New Music for Trumpet featuring Jack Logan. 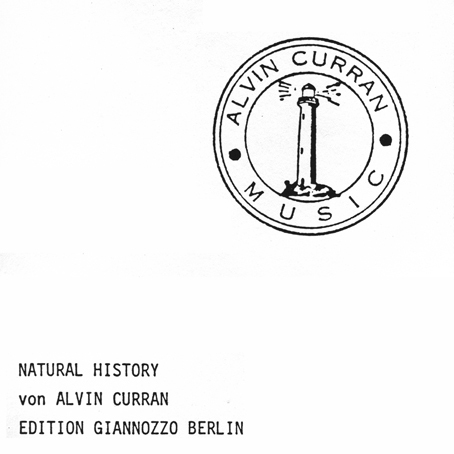 Alvin Curran is one of the most active and inventive avant-garde and electronic music composers of the current and past century. He was the co-founder of the radical music collective, Musica Elettronica Viva (MEV), and has taught at the Accademia Nazionale d'Arte Drammatica in Rome, as well as at Mills College, where he was a visiting Professor of Music from 1991 to 2006. He specializes in works for keyboard, percussion, winds, voices, and natural sounds, often performed at outdoor sites. In this program, recorded in March of 1991, Curran introduces a number of his works, including ÒErat VerbumÓ and ÒElectric Rags IIÓ. CurranÕs pieces incorporate ambient and musical sounds in a startlingly complex and lyrical evocation of the human spirit.